According to the description, "Glass jewelry is strong, though one should always wear with care." Mkay. 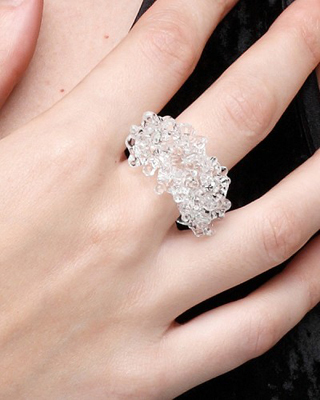 That's really pretty but I think I'd be afraid to wear a glass ring! Pff, I am seriously worried that I'm going to eff up my 90 year old emerald! I would bet money on losing a finger. As I have a boy who has a seizure when he cuts himself or sees someone else cut themselves on glass I'm going to go with no. I think that means no punching while wearing. Very limiting, in my opinion.